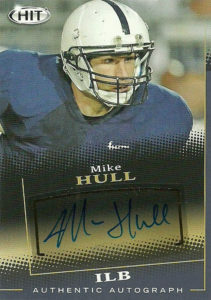 Mike Hull was a nice find by the Miami Dolphins. A diamond in the rough out of Penn State, Hull carries on the Nittany Lion tradition of Linebacker U. Hull played for the school during its collapse and rebirth from the Sandusky scandal from 2013 to 2014. He displayed versatility by switching from outside linebacker to inside linebacker under Bill O’Brien. He posted 216 total tackles, 15 tackles for loss, 2.5 sacks, 5 passes defensed, and 1 interception for 12 yards. His 2014 campaign earned Mike Big 10 LB of the Year. Hull was not selected in the 2015 NFL Draft. Scouts did not like his size or athleticism. Undeterred Mike signed with the Miami Dolphins and spent the season on and off the practice squad. He returned to the Dolphins in 2016 and made the squad. An important role player in Miami’s defense, Mike finished with 33 combined tackles and an interception that season. He returned in 2017 and started 3 games, posting 35 combined tackles and a fumble recovery.